The soldier is naked because he was probably ordered to strip to be sure that there wasn’t any weapon or explosive concealed. It was very rare for Japanese soldiers to surrender as it was deemed dishonorable. Those huge steel doors, and thick walls, must be a bunker of some kind. Probably a bunker with an artillery gun inside, maybe a coastal battery. The Marshalls Islands had been in Japanese hands since World War I. Occupied by the Japanese in 1914, they were made part of the “Japanese Mandated Islands” as determined by the League of Nations. The Japanese withdrew from the League in 1933 and began transforming the Mandated Islands into military bases. During the Second World War, these islands, as well as others in the vicinity, became targets of Allied attacks. D-Day in the Marshalls was set for 31 January 1944 with the U.S. Marine Corps 4th Division moving onto the northern half of Kwajalein Atoll and the Army’s 7th Infantry Division assaulting Kwajalein Island and the other small islands in the southern half of Kwajalein Atoll. 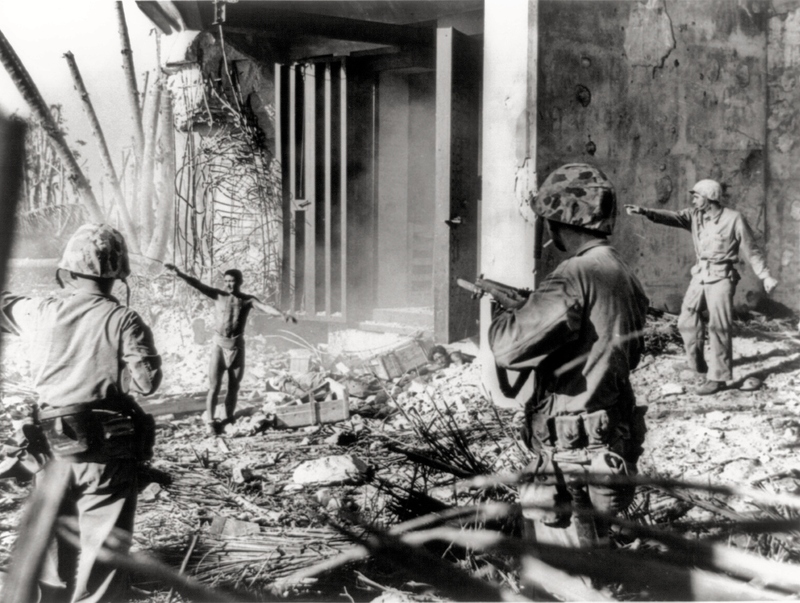 The Marines assaulted Roi Island and Namur Island, then the remaining smaller islands of northern Kwajalein Atoll. Once ashore, the Marines advanced rapidly. Roi was secured on 1 February and Namur the next day. In the seizure of the northern portion of Kwajalein Atoll, Marine 4th Division casualties were 313 killed and 502 wounded. An estimated 3,563 Japanese garrison forces were reduced to only about 90 prisoners. Subsequently all the other Marshall Islands were captured one by one. The Japanese soldiers were exterminated during confrontation or by committing suicide. Few decided to surrender. Rapid victory in the Marshall Islands added momentum to the Central Pacific drive and put Japanese positions in the Carolines and the Marianas within range of American reconnaissance and bombing aircraft. New bases were opened for the US Navy. The Japanese Navy, intimidated by the approaching US forces, reduced its fleet at Truk Island in the Carolines, formerly the bastion of Japanese air and naval power in the Central Pacific. The relatively low 3,000 combined casualties for Army and Marines showed that the lessons of Tarawa were put to good use. Tactics against heavily defended islands had been changed and improved, including the use of heavy bombardment prior to landings and better transportation to the beaches. The U.S. personnel in the photo are Marines, not soldiers. Soldiers in the U.S. Army's 7th Infantry Division did indeed take part in this first invasion of the Marshall Islands on Kwajalein Atoll, but their actions were confined to the southern half of the atoll, while the northern half was invaded by members of the USMC's newly-formed 4th Marine Division. The seizure of Kwajalein Atoll in late January and early February of 1944 was code-named Operation FLINTLOCK and is still considered one of the most perfect amphibious operations in military history. The tip-off for the identity of the personnel in the photo as Marines rather than soldiers is the cloth, camouflage-printed helmet covers, which were unique during WWII to the USMC. The soldiers in the Army's 7th Division wore helmets that were individually hand-painted in a camouflage pattern directly onto the steel, then covered with a netting material, which was used to attach foliage for additional concealment. Some of these nets were woven by Hawaiian civilian women while the 7th Division trained for the operation on Oahu in the fall of 1943. My late father was a lieutenant and rifle platoon leader in the 7th Division's 17th Infantry Regiment, which participated in the operation. If you look at the Marine on the right of the photo who is pointing, you can see the USMC and eagle, glob and anchor on the left breast pocket of his utilities. That Japanese was not naked. He was wearing a "fundoshi," loin cloth. Very typical. Not only is it hot in the Marshall Islands, by 1944 the Japanese had very few clothes. The Marine on the right appears to have no weapon, not even a sidearm on his belt, as would befit an officer. I wonder why, as the circumstances would not be kind to an unarmed combatant.